More than just a pretty face, the Malekko Wiard J.A.G. 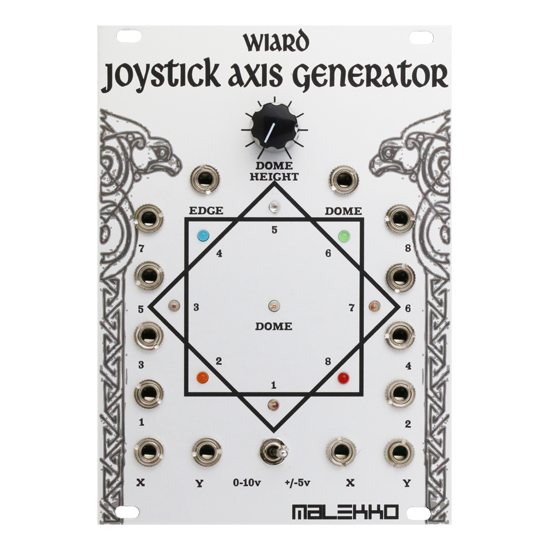 (Joystick Axis Generator) is a unique and often surprising device that can twist almost any patch into a new creation. It takes any two modulation sources (LFO, Envelope, Sequencer, Random Generator, Oscillator, X and Y of a Joystick, etc…) and maps out an X and Y location. From this XY coordinate, the output level of the 8 outputs in the circle are determined, as well as a center (Dome with level control) and Edge (opposite of Dome) level – multiplying your 2 modulation inputs and providing you with a total of 12 outputs. Read more below! More than just a pretty face, the Malekko Wiard J.A.G. (Joystick Axis Generator) is a unique and often surprising device that can twist almost any patch into a new creation. It takes any two modulation sources (LFO, Envelope, Sequencer, Random Generator, Oscillator, X and Y of a Joystick, etc…) and maps out an X and Y location. From this XY coordinate, the output level of the 8 outputs in the circle are determined, as well as a center (Dome with level control) and Edge (opposite of Dome) level – multiplying your 2 modulation inputs and providing you with a total of 12 outputs. The voltage distribution is most easily visualized with a joystick input; moving the the joystick will cause the LEDs to indicate the location of the joystick (as well as the level of each output), and the Dome LED will glow brighter the closer the joystick is to the center. Experiment with connecting different inputs and inserting the modulation outputs into different points in your patch to animate your creations in a way that you never thought possible with just two modulation sources! The input level can be switched to either 0-10 Volts (unipolar), or -5/+5 Volts (Bipolar). NOTE: The Malekko/Wiard JAG labeling of the polarity switch is reversed; just flip the switch and it will be easy to tell when you have the right setting for your modulation source. The Joystick Axis Generator is 18hp wide, 25mm deep, and consumes around 80mA power.